Understanding your options after Aiglon is a long process. Fortunately, Aiglon's expert College & Careers Counselling Office is there every step of the way. Are you curious what you, your son or daughter should be thinking about this time of the year in terms of applications? Take a close look at this list that the College & Careers Counselling Office have put together and contact them should you have any questions. Students completed all university applications. 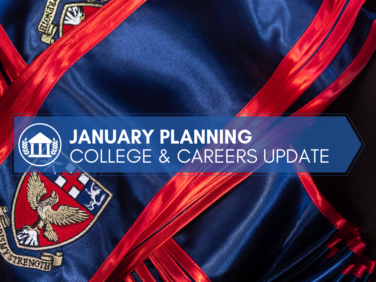 University interviews are taking place throughout the winter term. Admission results from the US will be released by the end of March 2019, and students have until 1 May 2019 to make a final decision and enrol in one university. Admission results from the UK are released on an on-going basis between now and June; conditional offers are made and students must wait until IB results are released in July to know if they met all the conditions of these offers. College Counsellors remain available to assist in housing or visa forms and the final decision-making process. Official meetings with College Counsellors started this month. Research summer programmes and talk with a college counsellor about how to complete the applications. If thinking of US universities, then consider the next SAT prep course at Aiglon in August 2019. SAT testing available in March, May, and October; SAT subject tests (if required) are recommended in June and November 2019. Plan to take official university tours or attend Open Days during school holidays (February, March and summer). The College and Career Counselling department spoke with all Year 10 and Year 11 students to discuss university options around the world and how to best build one’s academic and extracurricular profile to be most competitive for undergraduate programs. Other topics discussed were: career options, IB course selection, summer programmes, SATs for US universities, and the importance of mark readings and exam results. Continue to focus on academic achievement (IGCSE or Pre-IB programmes). Year 11 students will meet with Studies and a College and Careers Counsellor in February to discuss appropriate IB courses.